WELL DONE DOODS – HERE’S YOUR PRIZE! 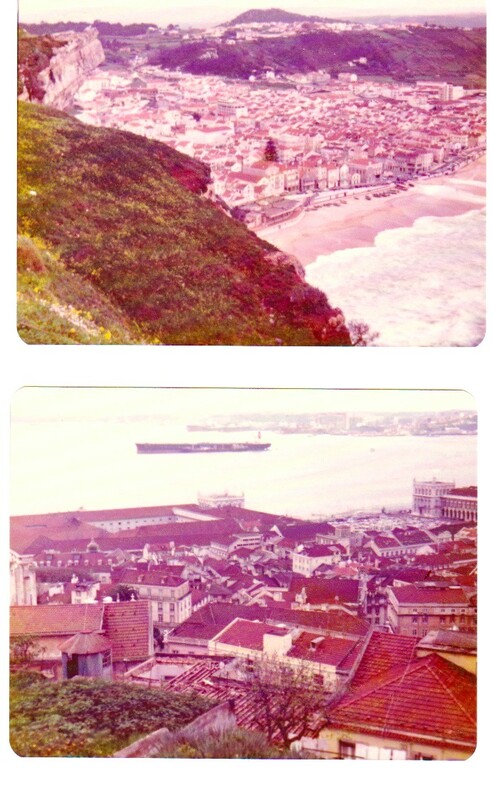 Remember that this photo was taken in the 60s…….and it was taken by my Mom’s Mom while on a trip to Portugal. This is the Fatima Cathedral in Fatima, Portugal and that big tree is known as “The Tree of Visions”…… this website talks a bit about this sacred place (**NOTE** there is a pop-up ad before you get the site – just click SKIP THIS AD to go to the site!). My Mom’s Mom was there with people from her office – she was a civilian employee of the US Department of the Army and her office went there for a conference and got to do some sight-seeing while there. If you look VERY CAREFULLY and CLOSELY at that little building that everyone is walking towards you might see a few people on their knees – a lady in white and behind her two other people – they are on their knees as they approach the shrine paying homage. SO – who was the FIRST to guess correctly?????? Well, that little honor goes to Da Phenny and his Staff – we think Angel Easy might have had a paw in it too – as you remember he was known as the KING OF TEASERS! AND OF COURSE – last but not least – we have the GREENIE BRIGADE! Didn’t know or guessed wrong? Here’s your badge! 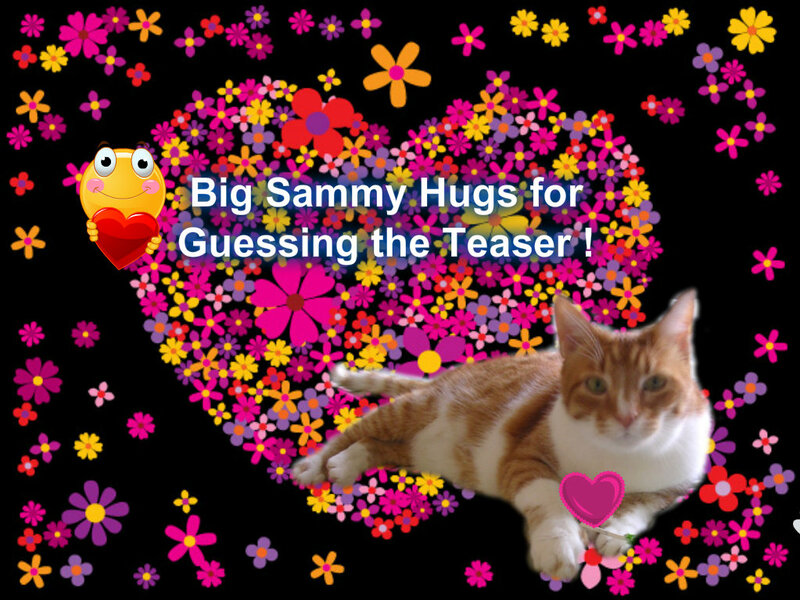 So that’s it for another exciting Teaser week………please remember, if your humans think they have a good photo for the Teaser – tell them to send it to us! We need some challenging photos for our “stash” of possible Teasers! It’s fun when you KNOW where it is to watch the guesses roll in! Okee Dokeee Friends and Neighbors! What a Teaser yesterday was huh? My Grandmom’s ancient photos really were a bit of a stumper although we DID have some correct guesses as always. Actually the very FIRST right guess was Easy’s Dad who guessed Portugal but then Doggy and Leo got SPECIFIC with their guesses and told us EXACTLY where the photos were taken in Portugal ! Here are the photos again…………. Here’s what Grandmom wrote on the back of each of these photos (which my Mom hadn’t seen until she took them out of Grandmom’s old photo album). When I posted these yesterday I thought it would be safe in saying that while these were very old photos that had been taken in the late 70s or early 80s, the place probably hadn’t changed much. I suspect that may be true although I bet there are a LOT more people on the beach in that top shot these days than back then! Lots of you thought the photos were in Italy or Greece and I believe there are spots in both of those countries that look very similar to this – my parents have been to Italy and say that’s right about THERE, but Greece (for us) is just a guess. Anyway, bravo to all of you who even took a stab at it this week since the photo quality was NOT very good. But I thought it would be fun to use old photos and from a place where my parents hadn’t been for a visit but someone in my family HAD! Who gets hugs this week? 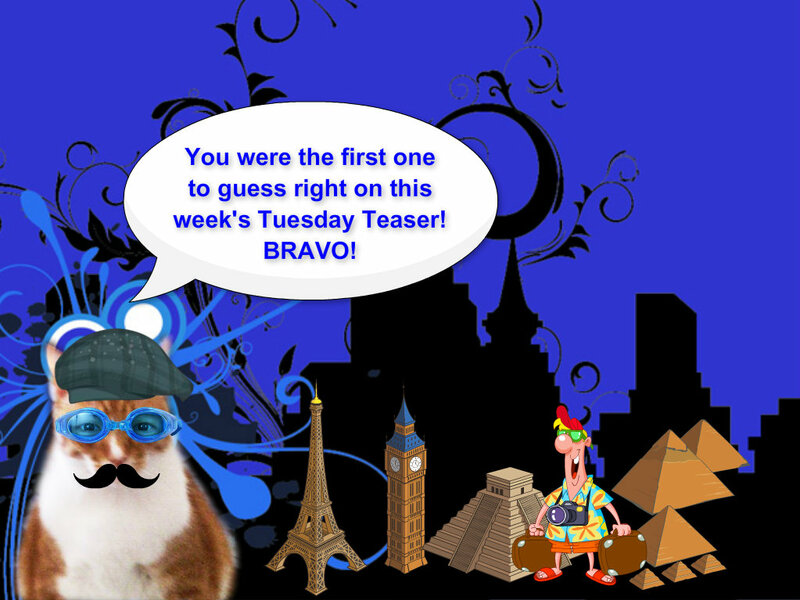 AND – I’ve decided starting next week we’ll have an extra added feature on the Tuesday Teaser Tell All. Whoever is FIRST to comment on my Teaser photo CORRECTLY is going to get a special NEW award in addition to my Teaser Hugs………how cool is that? Before I show you the new award, here’s what Easy and Doggy get from me! And, here’s the official unveiling of the little award that SOMEONE will get every week who is the FIRST to post their correct guess in my comments!!! WAY COOL HUH?????????????????? Now you have more reason than ever to get here on Tuesday mornings to guess ! !